What about the loudspeaker performance after the update? I've heard it has improved as well. I've just ordered this phone and loudspeaker is very important to me as I usually make lots of phone calls. A friend also told me the volume is alright but I haven't seen the actual performance on his Nexus 5. Any thoughts about this? Pathetic battery life. It's a cripple phone. Since the phone has been updated, can you please update the benchmarks??? Buyed this phone 1 months ago and it is really working smooth and fast.Awesome phone. Pls am having problems with downloading from playstores. How do I go about it pls. Always a fan of nexus series. Used nexus 4 and then bought nexus 5. Very disappointed with the bugs and hardware flaws. Returned it and now bought Samsung galaxy s4. Loving it for last few weeks. I know Samsung is bit late in updating the firmware but they make sure it works. nee, 04 Jan 2014which phone better....galaxy note 3,iphone 5s or nexus 5?? ?If you are comfortable carrying note 3 around, usually ladies are since they put it in their purses, then note 3. If you're ok with living in a beautiful and majestic jail then iphone 5s, otherwise nexus 5.
which phone better....galaxy note 3,iphone 5s or nexus 5??? started getting hang. interface is not good. no option to mark multiple contacts. Android Man, 06 Dec 2013well i got rid of my Nexus 5. could not cope with the dire battery life. does not even last a ... moreMine goes 2-3 days. 4-6 hours screen on time. You just need to tweak a few settings to double the screen on time out of the box but a Nexus user should know this already. AnonD-69099, 15 Dec 2013I'm planning to visit USA soon and I want to buy the nexus 5. How to order the rest of the wor... moreGoogle is your friend. 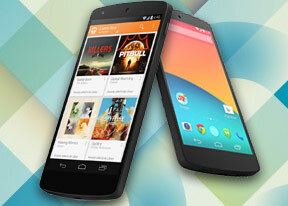 The Nexus 5 is an unlocked phone that uses a micro SIM card. Also you can try Amazon, ebay, or other electronic shops. Or directly from Play. It is $350/$400 for the 16gb/32gb. I'm planning to visit USA soon and I want to buy the nexus 5. How to order the rest of the world version from USA noting that a friend of mine who lives in the USA told me that it is available on Google play website but locked to sprint. And the price is 350$.and according to my knowledge the international version price is 350$ not the locked one. Anyone can help? The 4.4.2 has significantly improved the battery life between charges and the speaker volume. I just had a pineapple. It was lovely. I agree with TDMaster, battery usage is relatively low and completely enough for two days and I really don't expect that,,, believe me!!! I think this review needs to get an update about camera performance and other aspects too. My phone got the 4.4.2 OTA update 2 days ago in Iran. holds for a day and a half with 3G\WIFI usage and normal playing music Browsing..
i must say i was very impressed with the Battery for the better! !